In her WBEZ Curious City article "Why So Few White Kids Land in CPS* - And Why It Matters" , Natalie Moore seeks to find out why most white students fly off to private and parochial schools, while only a small percentage touch down among the brown majority educated by Chicago Public Schools. I wish she had looked harder for her answers. In never seriously examining the perspective of a family who rejected CPS based on class sizes, programming, or because they just wanted more for their children, the piece promotes the idea that school segregation is primarily a result of white families not wanting their children going to school with "those" kids, and thereby browning CPS. To me, "Why So Few White Kids. . ." lends itself to shaming parents who refuse public schools. And it's not only white parents who avoid CPS. There are plenty of African-American parents who reject their neighborhood public school, for reasons that are just as complicated as their white counterparts if not more so. We moved to Hyde Park over nine years ago. As a mixed race couple -- my husband is white -- we loved its diversity and village-y feel. We knew we'd be starting a family in the near future, and bought our home so that the then leading public elementary in town, Ray, would be our neighborhood school. We loved the idea that our children would attend school with children from varying socio-economic groups, with different color skin, who spoke different languages at home, whose parents were gay or lesbian -- you name it. "Difference" would be the norm, and they'd receive a quality education. However, by the time our older child was ready for kindergarten last year, the school had changed. The principal who presided over the school's most recent grand era retired, and the following administrations were plagued by dissent and scandal. Furthermore, with the wave of school closures, Grades 7 and 8 were added, destabilizing a school that felt comfortably young. The shiny school on which we had pinned our hopes was tarnished. We had sent both our children to intimate, nurturing preschools with inquiry-based, child-centered curricula, and a low student-to-teacher ratio. But these schools were costly, and wanting a tuition break, we decided to give public school a try. Our son, Mr. R, didn't test into any selective enrollment schools, and as far as the lottery-based schools went, we didn't stand a chance. Our high lottery numbers were pointing their fingers and laughing at us. So Ray it was. After all, we had many trusted neighbors and friends -- loving and intelligent families -- who sent their children there. With their vote of confidence, it had to be good. We talked with many parents to get the lowdown. We were warned about large class sizes, sometimes stressful homework, and bullying incidents -- daunting, but nothing out of the ordinary. Still, each family reported that their children were learning -- thriving even. They had wonderful teachers and had formed solid friendships, which, really, was all you could want. And bonus, it was a community school. We exhaled and moved forward. But on the first day of school Mr. R came home and told me about how a boy was pushing other kids during movement, and he asked the boy to stop. The boy got in his face and used words that included "niggas" and "asses," words we do not use in our home. To boot, Mr. R reported the incident to the teacher who was a special, not his classroom teacher, and was met with, "Go sit down, you’re fine," or something similar. I emailed the classroom teacher the next day, who said, understandably, that she could not get involved because she hadn’t been there. If she stepped in, it would turn into a he said/he said situation. It didn't help that since it was only the first day, Mr. R could identify neither the boy, nor the teacher. Incidents like this became fairly regular. To be fair, these things happened when he was away from his classroom teacher. When he was one child among the 70 plus supervised by three adult staff members at lunch and/or recess. At home, Mr. R. was an anxious, frenetic mess. He began using the bathroom every 10-15 minutes. By the Friday of the third week, enough was enough. I found a bruise on the side of Mr. R’s hip one night as he was getting ready for bed. He had been thrown off a rocking horse on the playground. But that wasn't all. "I have a bump on my head," Mr. R confessed, rubbing above his ear. Apparently an older child had told him to close his eyes and run. "Why did you?" I asked. Mr. R didn't know why, but he did, and wound up running into a pole. Once again he found himself crying and reporting to the aide in charge. He had identified the culprit, but the boy had denied it and had run off laughing. We were done. Earlier in the week, Hubs had called the local Catholic school, the one we had originally written off due to cost and the fact that we aren't religious. However, there was no way we could continue to send our son to a school where he was being hurt, received no comfort and witnessed no establishment of accountability. No matter how much I appreciated his teacher, who was both kind and competent, I couldn't send my son to a place where once he was out of the classroom, the adults didn’t seem to care about him. That was simply unacceptable – a deal breaker. The next Monday we sent Mr. R to school, while we finalized registration at our local Catholic School. Just to make sure we weren't making a rash decision, I decided to check out recess at Ray for myself. Three adults stood stationed around the perimeter of the unfenced playlot, while hordes of children played. And then, I noticed the behavior that drove me to march on over to that Catholic school and sign my son right up: three boys peeing in the open, plain as day. The adults in charge didn’t notice a thing. The next day, Mr. R was a Catholic school student. Even though I did discuss the hard time Mr. R was having at school with our neighbors, I felt awkward about telling them that we were pulling him. I knew it would raise the question of "Why isn't it good enough for you?" With some of them, but not all, I mentioned the elephant in the room. My immediate neighbors were all white. Their children weren't subject to the same social pressures mine was. Surely my son would have to develop the ability to "hang," navigating the line between "proper" and "street." But not like this, and not when he wasn’t even six years old. Even though he was in a diverse environment, I feared what staying there could have done to my son. Mr. R was absorbing some devastating ideas about race because, heartbreakingly, it was African-American boys who were treating him so badly and whom he observed making such poor choices. Mr. R was trying to have fun and fit in, but was unsure what to do when things became too rough. Without proper adult mediation, how long before Mr. R began fighting to defend himself, and was then lumped in with the troublemakers? His brown skin made that label too easy to come by and too difficult to shed. We couldn’t take that risk. We've been happy since we left CPS. Mr. R is in a diverse environment where there is both care and rigor. We realize that we were unlucky – Ray meets the needs of many families beautifully, but it was a terrible fit for Mr. R. Are there other CPS schools that would meet his needs now, or possibly in the future? Do we still believe in and support public education? 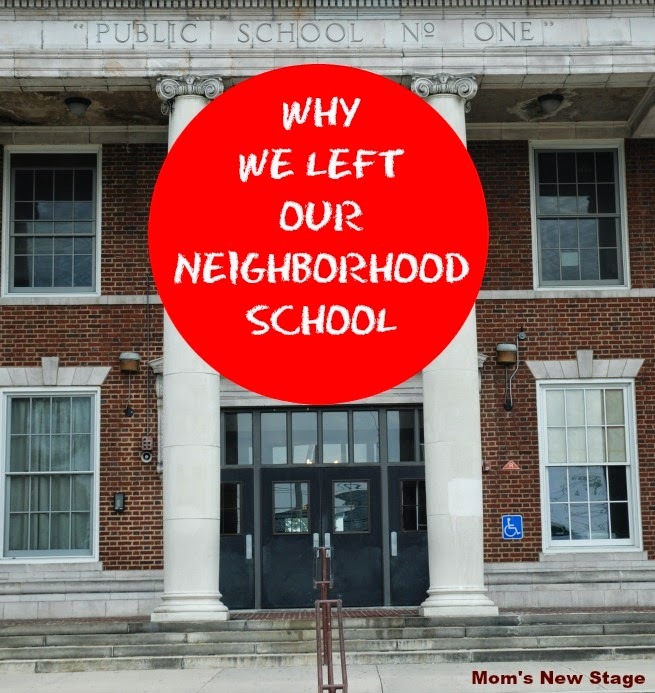 We wanted to love our neighborhood school. But like many parents from varying backgrounds, why would we sacrifice our child at the altar of public school, when we have the resources and the wherewithal to do otherwise? And should we really be expected to? Chicago's racially polarized public school landscape is broken, and must be analyzed and overhauled. Surely, some of this segregation is the result of racist and elitist white flight. But instead of guilting parents for school segregation, let's look at why parents reject CPS. Let's have a look at the deeply complex issues involved, and realize that at the beating heart of school choice is parents' fierce love for their children. *- In this article, CPS stands for Chicago Public Schools, NOT Child Protective Services. Well said. We all have to do what's best for our child. The real crime here seems to be there were no rules in place outside the classroom. It was like a free-for-all, and that is insane in any school although I know it goes on. It's a failure of leadership and basic safety.